Just saying it generates a grin, like some sort of oddball onomatopoeia from a Dr. Seuss story. And when you witness the band’s progressive, eclectic and high-energy mix of music live, you’ll inevitably dance and smile till you’re sore. 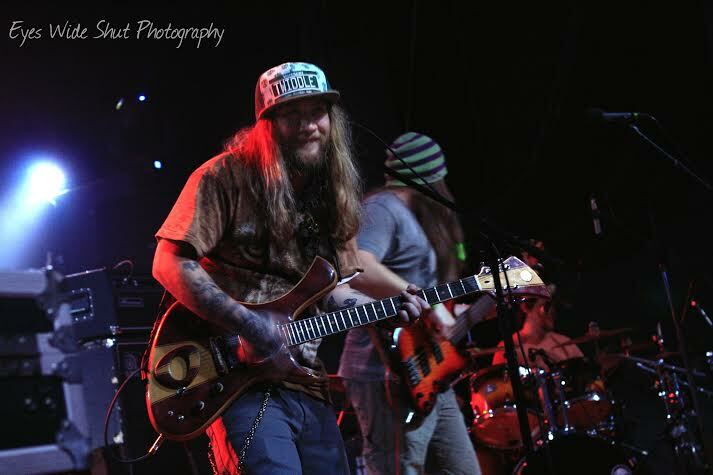 Twiddle hails from Castleton, Vermont but call Colorado a second home. Their show on November 13th at the Aggie Theater in Fort Collins, Colorado kicked off a four-night rocky mountain run that featured sold-out shows at The Bluebird Theater in Denver and The Fox Theater in Boulder. These Colorado concerts are part of the last leg of Twiddle’s 39 show, Chilled Monkey Brains Fall Tour that included recent dates alongside Papadosio, The Werks, Zoogma, and an array of surprise guests. Their live show is as unpredictable as it is undeniably fun and free-flowing. Specific songs showcase the rock edge of Umphreys McGee, while others wander whimsically like a Phish show, reggae songs spark notions of Rebelution, and if you close your eyes during any of their acoustically-driven jams it sounds like Nahko and Medicine for the People. 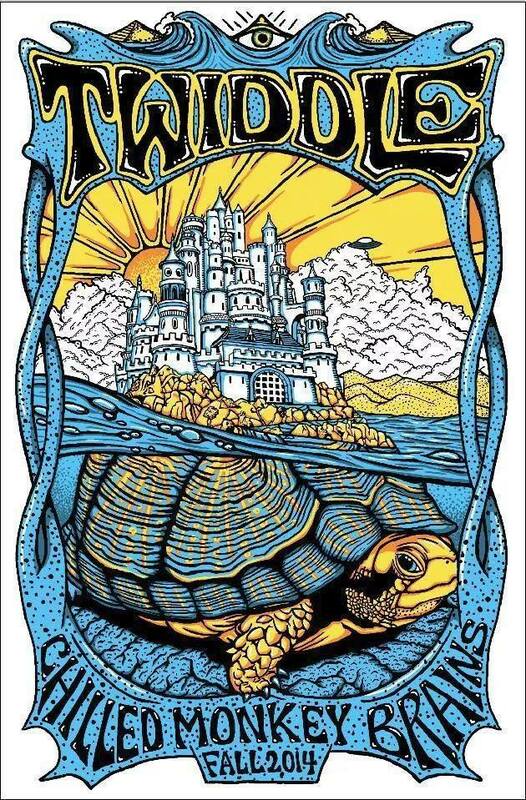 But Twiddle is much more than a collection of comparative bands. They cook up a gumbo of genres so tasty that trying to pinpoint a particular ingredient or influence would take away from the overall flavor. A unique flavor they describe as, “3-dimensional music,” that, “obliterates the laws of improvisation and spins tall tales over an intricate soundscape of hi-def shred.” Which is about as accurate and abstract as it gets when attempting to describe the music they make. The captivated crowd is much more concerned with dancing to their music than defining it, and the fun-filled family atmosphere at The Aggie Theater was a warm and welcoming escape from the early winter chill outside. “Thanks for coming out on this cold cold night,” says lead singer and guitarist Mihali Savoulidis, looking even more like a lion as his long locks dangle down over a large lion face t-shirt. 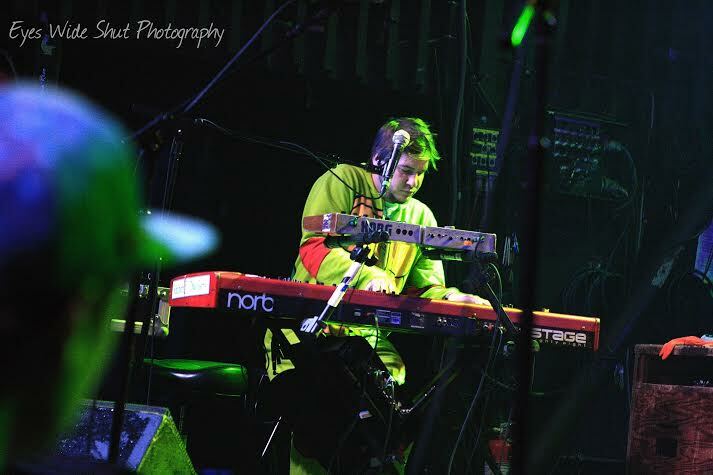 To his left, bassist Zdenek Gubb is shoe-less in his trademark beanie bouncing up and down on a hyper-orange moon mat as Brook Jordan sits smirking uncontrollably behind his drum set and Ryan Dempsey delivers killer keys while wearing a Teenage Mutant Ninja Turtle onesie. The entire band appears very at home on stage; exhibiting a combination of comfort and comradery that can only come from a foundation of friendship and tirelessly touring across the country. There are times throughout the set that seem as if we’re witnessing the type of magical jam session that only exists in an intimate home studio set up. 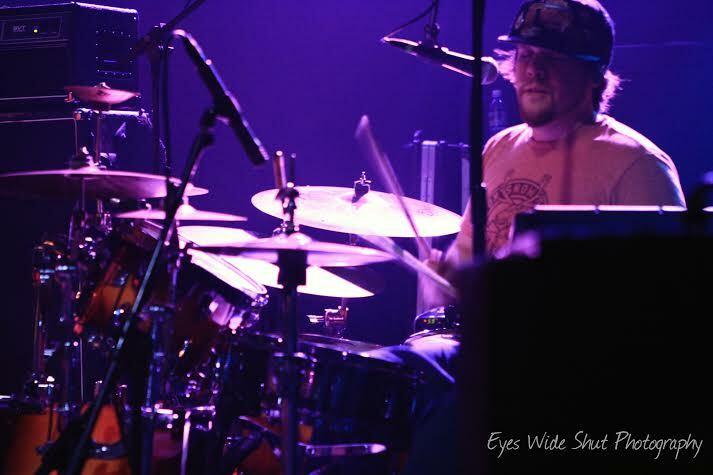 It’s immediately evident that every member of Twiddle is a masterful musician and their ability to adapt seamlessly to any style transforms seemingly ordinary songs into exciting, ever-evolving musical experiences. 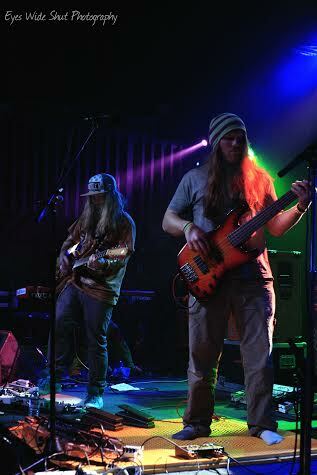 With this tag-team of talent and tenacity, Twiddle is clearly the type of band that will be around a long time. They’re not only surviving, but thriving within today’s constantly changing music scene. Proving that amongst an almost endless sea of ‘jam bands’, quality will always triumph over quantity. Thus, Twiddle has transformed from the funny named band near the bottom of a festival bill, into the type of band that plays the main stage and makes instant fans out of anyone who happens to hear them. 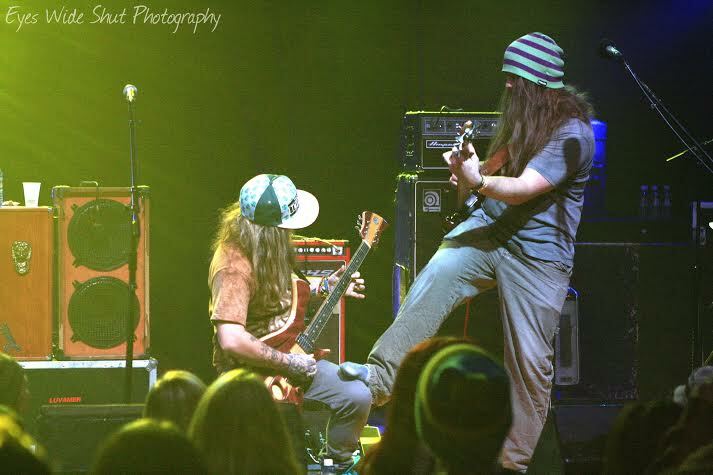 In fact, most people in attendance at The Aggie Theater credit a trusted friend or a random festival for introducing them to Twiddle, and like myself, almost everyone has turned that initial introduction into many more shows and stories of the band treating them like family instead of fans. Some of that family even flew out from as far as Vermont and Massachusetts for this string of shows, and their fanaticism is well warranted. 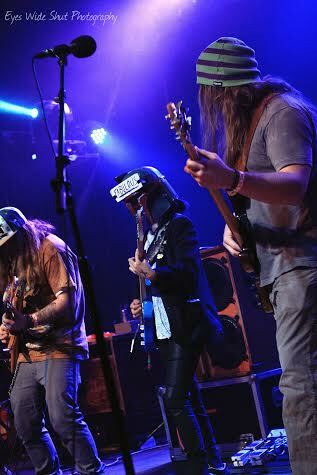 Their efforts were rewarded with rowdy covers of Sublime’s “Smoke 2 Joints” and Jimi Hendrix’s “Purple Haze” as well as fan favorites like “When it Rains it Poors” and “Frankenfoot”; for which they brought out local guitar prodigy Jaden Carlson who walked on stage sporting a Boba Fett helmet and ripped through technical riffs as if her talent truly came from a galaxy far far away. For tickets and additional info click here and if you’re still undecided on how to ring in 2015 the boys will also be playing The Palladium in Worcester, Massachusetts on New Year’s Eve alongside Dopapod.